New York is a city for running. (And , more and more.) Here are three scenic routes around rivers and bridges, with easy and hard variations for each. NEW YORK CITY – I scream, you scream, we all screamed for ice cream all summer long. And now we must pay for it in the form of exercise. But all joy is not lost. The tail end of summer and early fall makes for perfect running conditions. There's still an early sunrise, it's light until late, and, in the case of NYC, you can get inspired by marathoners going on long training runs. Here are three city loops to keep you on your feet. You love the Central Park loop, but you're looking for some local flavor. Or a gorgeous sunset. Either way, head west. 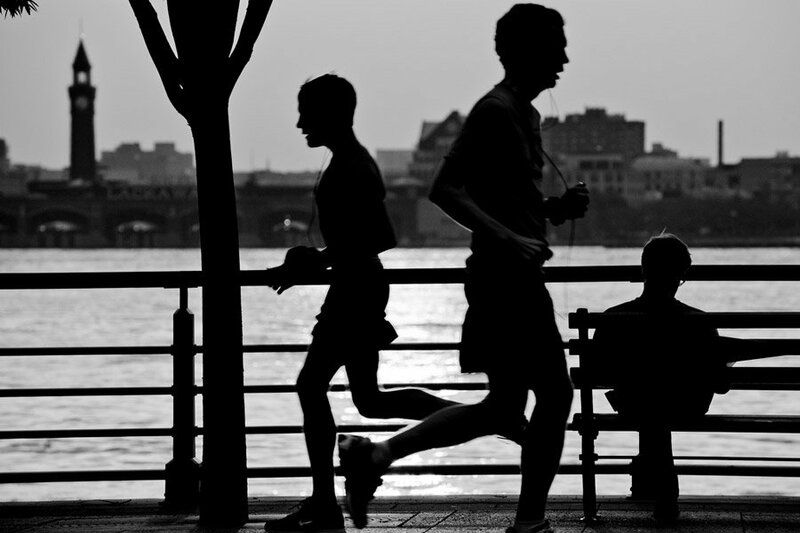 The Hudson River Greenway is a favorite among walkers, runners, cyclists, and everyone in between. Though afternoons along the Hudson tend to get crowded, this route's easy on-off access and proximity to some of the city's best sights makes it just about the perfect route. Where: The path runs from the Bronx all the way down to Battery Park and is accessible from nearly anywhere. Length: 8.89 miles (regular) or 2.94 miles (short). Cut it short: The out-and-back nature of this route is really flexible. Turn around at 14th Street for a three-mile loop or head uptown to 79th to get four. When to go: Early morning or early evening. During the day, there is limited shade and lots of foot traffic. Good to know: You'll share the path with cyclists, so stay alert. Above 72nd Street tends to be more tranquil. What you'll see: From bottom to top, highlights include the Statue of Liberty, Chelsea Piers, USS Intrepid, art installations, the George Washington Bridge. Want more expertise like this? Discover the and get our guide to becoming a better traveler when you . If you're ready to break out of your long-run routine, try this route that is definitely NFT. Bet you've never run like anywhere like this before. Where: From the top of Central Park over the RFK Bridge to Randall's Island to Queens and back. 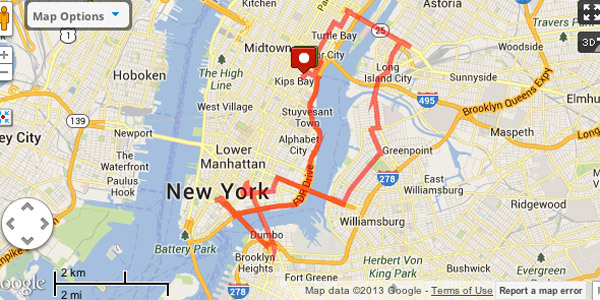 Length: 16.07 miles (regular) or 5.26 miles (short). Cut it short: Skip Queens. Head over the 125th St. Bridge and run along the west side of Randall's Island. 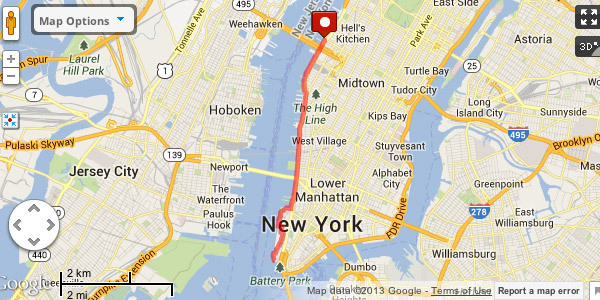 Cut across the Ward's Island Bridge and follow FDR to 110th Street for a five-miler. What you'll see: Killer waterfront views of Manhattan, Hell's Gate Bridge, Astoria, Queensboro Bridge. Did I mention beautiful views? Rather go island hopping? The Five Bridges route criss-crosses three boroughs and is perfect for the seasoned NYC runner who is ready for a little adventure. Where: Practically everywhere. The bridges you'll cross include 59th St. Bridge, the Pulaski Bridge, the Williamsburg Bridge, the Manhattan Bridge, and, last but never least, the Brooklyn Bridge. Length: 16.68 miles (regular) or 3.37 miles (short). Cut it short: Run two bridges instead: Start at Borough Hall and head directly over the Brooklyn Bridge. 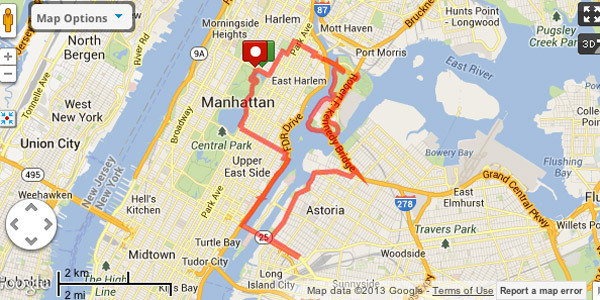 Cut across to the Manhattan Bridge and back down to the starting point. When to go: To avoid traffic, definitely go early weekend mornings. Sunday is best. What you'll see: The better question is, what won't you see? Leah is a grants coordinator at Harlem United. She travels for the sun, the chocolate, and the new perspectives.